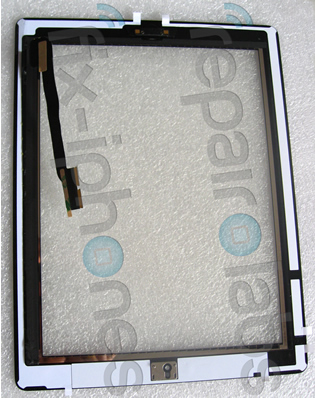 Fix-iPhones claims to have new photos of the iPad 3's digitizer (the glass front that provides touch-sensitive input). They've posted the photos on their Repair Labs blog along with a link to earlier photos which also claim to reveal the iPad 3's rear housing (the back of the device). Although the photographs provided are large and the website details some of the differences between the current digitizer and the new one, viewers may want to remain skeptical. We've seen our fill of fake iPad and iPhone photos and this may be no exception. With that said, these do look pretty convincing. If the information is true, anyone hoping for a radical redesign will likely be disappointed. All in all, the photos suggest the iPad 3 will look exactly like current generation iPads. Only white and black digitizers are shown, so we can infer the the iPad 3 will come in your favorite colors. Well, as long as your favorite colors are either white or black. Also, the photos clearly show a home button. There were rumors abound that Apple's latest tablet would not feature a home button. This rumor probably originated from Apple's invitation to the upcoming iPad 3 media event on March 7. On the invitation, it shows a person opening the calendar but there is no home button around the edge of the device. This is, of course, explained by using the tablet in landscape mode. Rumors are much more exciting than mundane explanations though. Fix-iPhones speculates that changes to the shape of the logic board will allow for a higher capacity battery. They also confirm rumors that the device will be slightly thicker by about 1mm.